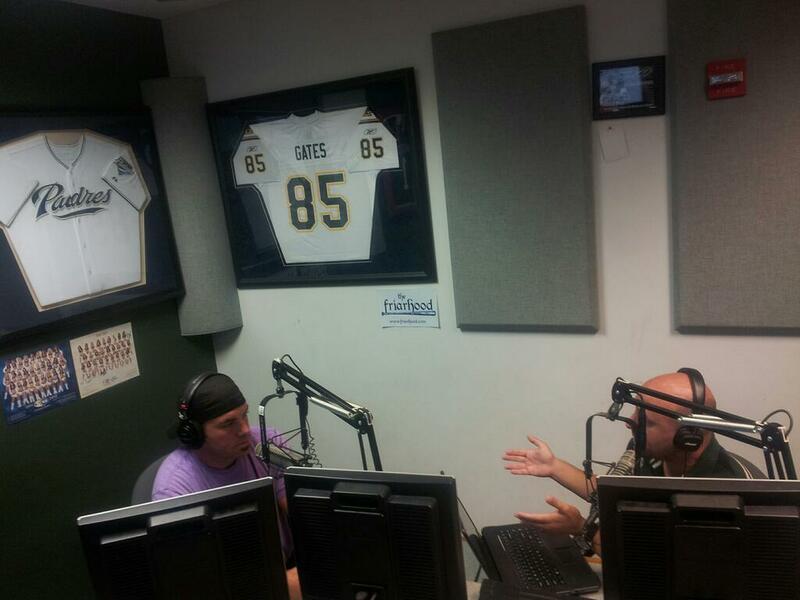 That’s me on the left, Steve Adler on the right… in studio at XTRASports 1360, photo courtesy of Joe Nelson. I’m a little late on this because it’s been a busy week, but I had the opportunity to co-host the Steve Adler Show last Saturday. It’s dated by 6 days, but still some good stuff on the Padres, hoops, and other sports talk. Steve had Ryan Mathews and Antonio Garay in studio the previous week, and then me… serious freaking downgrade. I tried to embed it above, but if that doesn’t work for you, you can give it a listen here if you like, or don’t. Some mildly heated debates in there. I had a great time. Steve was looking a bit scruffy, so I asked why. Turns out he is growing out his beard and won’t shave until the Padres win 3 straight. Decent chance he looks like one of the dudes from Duck Dynasty by the end of the season. Thanks again, Mr. Adler. Good times. This entry was posted in Media and tagged friarhood, LobShots, lobshots radio, steve adler. Bookmark the permalink.